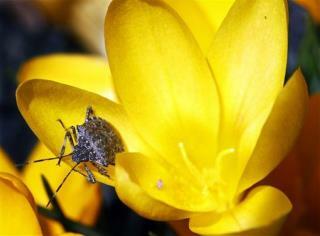 (Newser) – Stink bugs have infested the eastern US, devouring crops in Pennsylvania, Maryland, and nearby states, CBS News reports. The brown marmorated stink bug has no interest in people, but farmers hate the insect because of its voracious appetite for crops and because it, well, stinks. (When threatened, it emits a "pungent odor," notes the Roanoke Times.) "This is definitely the worst year for them that we've seen," says a Penn State horticultural assistant. The Roanoke newspaper, which rounds up complaints from people who have the heebie jeebies from seeing dozens of the critters hanging out on their screens, points out another creepy fact: The bugs are looking for a winter home, so if they get in the house, they're likely in for months. The only good news is they don't bite humans or cause structural damage to homes. Entomologists caution against using pesticides; alternatives include knocking them into a bucket of water with a broom or using a vacuum. For news on that other invasion, the one by bedbugs, click here. In the end times plagues will return as they did at the first. So here we are. Lice, bed bugs, stink bugs, the good bugs getting gone, waters being turned into death sludge gosh all sounds familiar to me. I heard that they're mainly congregating around the federal buildings in DC. I vacuumed about 300 of these things last night with the skinny hose attachment and after that I sprayed BugStop all over the window and door frames. This morning I woke up to see about 30 or so dead ones on the floor by the window. For the outside there is a brand of Raid that works well but the store was sold out so I will try that when they have it. Seriously, for those who are all against pesticide, enjoy picking up individual flying stinkbugs, one at a time, possibly hundreds of time over to dunk in soapy water. The rest of us have things to do.